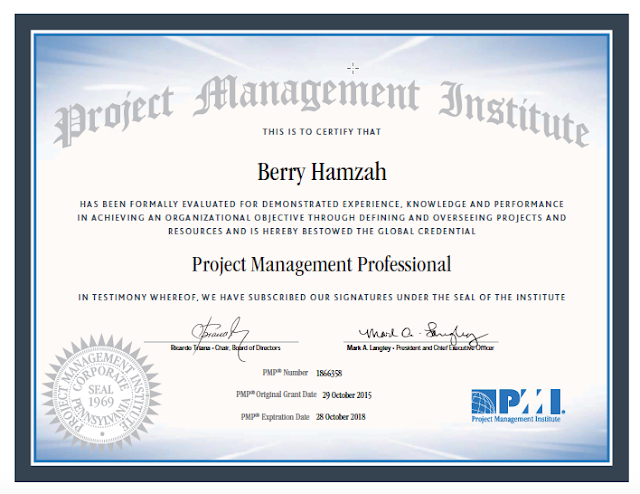 I recently passed my PMP exam. I want to share some tips for you who are preparing your self to take the PMP exam. Before that, let me explain little bit story about my self. In August 2015, my work contract end, while i was actively looking for job, i decided to take the opportunity to study and pursue some IT professional certifications. In the month of September, I studied ITIL Intermediate in Service Operation for 3 weeks and attended exam on the fourth week. This was a really tough exam, i failed 2 ITIL intermediate SO exam before i finally passed the exam at the third attempt. Feeling great and relieved. I can honestly say that it was probably the most challenging exam I have taken. Glad to have the ITIL SO certification. It was a great learning experience. Enough about ITIL, let's continue my PMP story. In first week of October, i submitted my PMP application and join a membership in PMI.org. As a member, i can download a copy of PMBOK fifth edition. Recommendation: I would recommendation everybody to go into detail the video provided by izenbridge.com by Saket Bansal. Important note here, all the practiced questions will not come up on the exam, this just help you to understand the knowledge area and process group. Questions in the PMP exam are almost asking about your knowledge and action you will take as Project manager in given scenario. I took PMP exam on 29 October 2015, and i finally pass on the first attempt with result 4MP and 1P. So don't be afraid to fail, be afraid not to try. Failures are part of live, if you don't fail you don't learn. If you don't learn, you will never change.